After a long break I went back to the Geneva International Motor Show last year. Aston Martin presented the DB11 and I thought I couldn’t be more excited. I was wrong. Initially I was not planning to go to Geneva, but then Aston Martin broke the news they were bringing three premieres to the show. I got the chance to go on Tuesday (press day), which meant I could not possibly resist. I did mention last year that the show elements I had grown accustomed to have mostly disappeared. This is not the case for the first press day. Everything starts on Monday afternoon, as in the evening the Car of the Year is revealed. On Tuesday the day is filled with press conferences and these are shows! The manufacturers bring often more than one of their VIPs, promotional videos are shown and most don’t shy away from a light show. 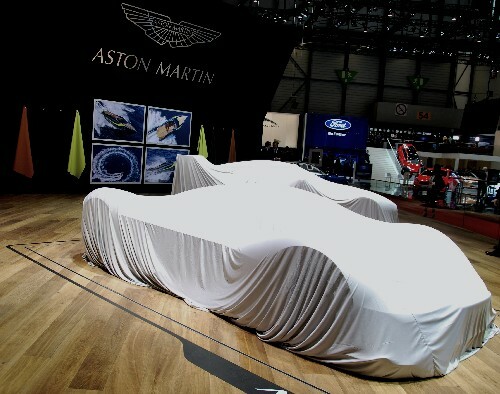 The quiet before the storm, or – in this case – the Aston Martin stand before the press conference. It is impossible to see all conferences, because they follow each other in quick succession and you’d have to run from one hall to another at times. I managed to catch the conferences of Audi, Lamborghini, Porsche and Aston Martin. Especially Lamborghini stood out for me. The actual presentation itself wasn’t that long (as in: not a lot of talking). They alternated between live presentation and a few videos and it was one of the videos that got my attention. After leaving WEC at the end of last year’s season Audi Sport have now presented their DTM challenger: the new RS5. They presented the car simultaneously with its road going sibling. In addition they confirmed their manufacturer team entry for Formula E’s 2017/2018 season. There’s a lot going on at Audi. Bentley presented the EXP 12 which is an electric car. Style wise it fits in perfectly with the Continental and the Mulsanne. It looks amazing and I hope we get to see and hear more about it soon. Between the BMW i8 and Bentley EXP 12 I think we can safely say electric cars are stepping away from looking boring. I didn’t make it to the Volvo conference, but was right next door (at Aston) when their conference happened. I had already seen all the Volvos were wrapped up in cocoons (different, to say the least). The presentation seemed to focus mainly on how natural the car is, how great it feels, etc. Considering they were presenting the XC60 I think they totally missed the mark. Having owned a Volvo 440 and test driven the S90 I am amazed at how horrible the XC60 is. However, I should take into account it’s an SUV and I’m not a fan of SUVs in general. There’s only a few I like, for example the Mazda CX-3 and CX-5. They at least prove that an SUV can still have nice lines and it doesn’t have to be massive. Volkswagen and I are not really friends, but there are a few models I like. On trips to the Nürburgring I have driven an EOS and a convertible Golf. I fully believe they should have left the Scirocco alone. I also think the CC is one of the sexiest things on four wheels ever built. Safe to say I haven’t quite made my mind up about VW. When strolling over their stand I was pleasantly surprised by the Arteon (pictured above). It has all the things I like about the CC while still being recognisably Volkswagen. Very nice indeed. It was great to see so many race cars at the show. Ford brought their WEC racer, Rebellion brought their LMP1 car. Abt was there with their Formula E car. Toyota had their LMP1 car at the stand including a part-car display where you could have a better look at the cockpit. A look inside the Toyota LMP1 car. 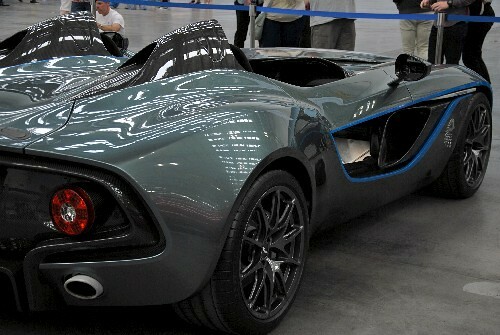 Last year Aston Martin shook up the car world by presenting what was then called AM-RB 001. It’s low, it looks mean (yet smooth), its aerodynamic characteristics are created by Adrian Newey, it’s very fast and will be road legal (yes, really). The day before Geneva they revealed the lady’s name: Valkyrie. Not surprising then that it was very busy at the Aston Martin stand when the time for their conference came. Even though the car has been shown already and further details have been released in the past year, it still draws the crowd. Who wouldn’t want to see this with their own eyes? Now I have seen the car for myself I can confirm she’s a sight to behold. I find it unbelievable that you can sit behind the car and look underneath it from rear to front. Especially the rear is quite high, despite the car being very low overall. It will be very interesting to see (and hear!) this car when a working prototype is completed. Aston Martin also had a surprise for us: AMR. They took the opportunity to launch a new brand which will be bringing racing technology directly to road cars. The Rapide AMR looks surprisingly sporty for such a big car and wears its makeover quite well. I understand the Vantage AMR Pro will be track only whereas the Rapide AMR will be a road car. Going to the Geneva International Motor Show on press day has been a privilege. It gave me the chance to have a much better look at the new cars and to hear the details from some pretty important people. I can’t make any promises, but I will certainly try to get press passes to this show and other shows/events. It will allow me to get that just that little bit more to write about. I was in London. I was on my way to the London Transport Museum. And then I almost passed the London Film Museum. Almost. Because when I realised their current exhibition is ‘Bond in Motion’, I also realised there is a DB10 in there. I went in to have a look. Not sure how many people know this, but it is said that the first car manufacturer to be offered having their car featured in a James Bond film was Jaguar and that they turned that offer down. If true…ouch! 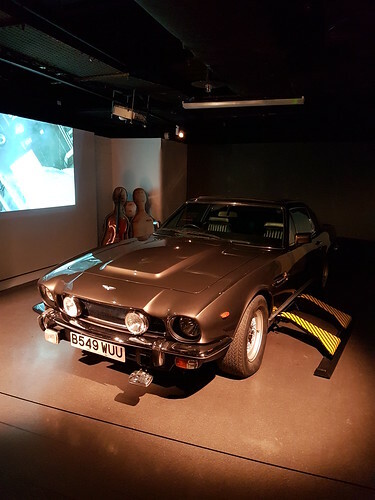 It is now well known that the Bond franchise has a very strong connection to Aston Martin for several decades, so it’s no surprise that at an exhibition about the James Bond films you will find several Astons. Previously the films would feature a model of a car (not just Aston Martin) which you could buy, minus all the weaponry and toys, of course. For Spectre Aston Martin built the DB10. Two of the ten cars built have been used for promotion, so people have had a chance to see them. I would say not many people had that chance though, because these promotional events were usually in big cities etc. I live in the UK, but not in or near London, so no chance! This exhibition was possibly a once in a lifetime chance to see a DB10 for real. But let’s go back to where it started for a moment. Say the name ‘James Bond’ and, if you’re after word association, a lot of people will say ‘DB5’. It has gotten to the point where people see a DB5 in the wild, point at it and say ‘That’s James Bond’s car!’. It could be an interesting discussion about how iconic the DB5 would have been without James Bond. Of course that’s impossible to say now, but the association is quite strong and I’m sure it has done the company a lot of good. In the same vein I get the idea that the other models used in the films never were that well known to the general public. They still know they are Astons, but not which type. And I shouldn’t forget to mention that other car manufacturers feature in the Bond films too, most noticeably Jaguar. In that ever growing group of cars the DB10 may well be another game changer. 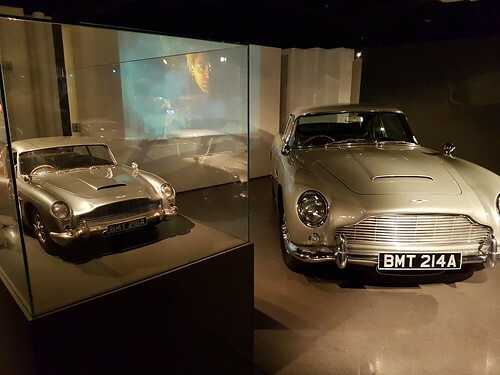 The exhibition features the vehicles of the James Bond films. Of course my main focus is the same as always, single-minded as I can be, but seeing other cars, boats, the cello case and motorbikes is a great feast of recognition. Because of course I have seen James Bond films; quite a few of them. When you see any of these vehicles/modes of transportation you get that deja vu feeling of being in the cinema again and watching the most memorable scene in which it featured. The Aston Martin V8 which featured in The Living Daylights, with the cello case in the background. I remember visiting Aston Martin at Newport Pagnell (mere months before they closed the factory) and a ‘James Bond’ V12 Vanquish was on display at Works’ reception, rockets and all. Of course this car is part of the exhibition as well. Unfortunately (because, oh, how that hurts to see!) there are also two ruined examples (both DBS). I hoped they were made to look like that, but according to the guide book the cars really sustained this damage during filming. It really is a pity I can only offer video footage and some photos of the DB10. The reason I say that is because I didn’t like it at all when I first saw it. The grille is much wider and lower than on any other Aston, the headlights are a lot smaller and there didn’t appear to be many outstanding features at all. I’ve changed my mind completely now I’ve seen the car. There definitely are outstanding features. They are just more subtle than we are used to seeing. On the nose, for example, there are no slits/gaps with mesh, there are perforated holes. Detail of the DB10’s nose. The lines on the nose continue on the roof, but this is not very visible on photos or film. The lines at the side of the car are quite sharp and guide the eyes beautifully from the front to the rear. 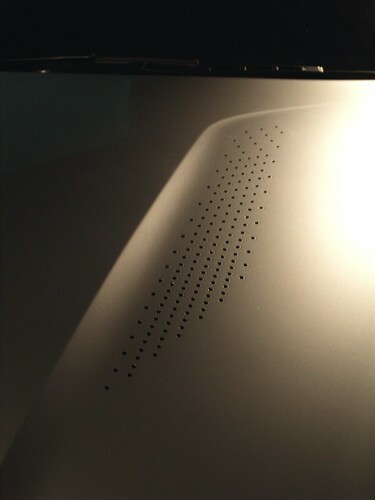 The parts of the car which are made of carbon fiber are also wonderful details that usually would remain unseen. The thing that stood out to me first and foremost is the car’s width. I have seen many Aston Martins, old and new, and this one just seemed much wider. Predictably the internet is uncharacteristically quiet about the DB10’s details, but I managed to find out that the car is about as wide as the One-77. And the One-77 is 30cm wider than most modern Astons. This is a big car. It looks mean (apologies to the sharks it resembles), it looks dangerous, but it is absolutely stunning. 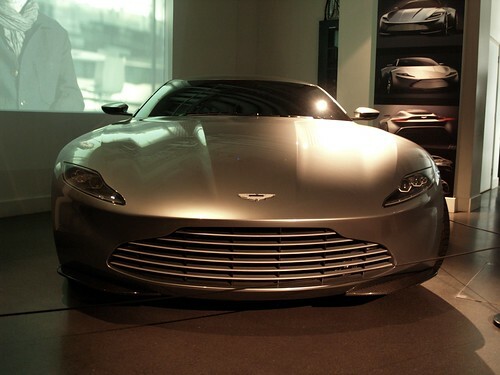 The imposing glare of the DB10 in full force. The DB10 truly is the DB11’s forebear. I think the DB10 is uncompromised. With that I mean that the DB11 is a wonderful combination of the One-77, the Vulcan and the DB10; almost as if the most popular features were put in one car, ensuring its success. However, the DB11 has its main look from the DB10. The DB10 is raw and possibly an acquired taste. If you ever get the chance, I suggest you go see one and decide for yourself. Another Autosport International show at NEC, Birmingham. I could complain about the same things I complained about before, but I did go. Begs the question why I would go anyway. Here’s why. I’m still not happy with the fact the information on which I base my decision to go or not to go on is released far too late. So again I got my tickets very shortly before the show. But to be fair to them, the rest is all good. Last year it seemed very busy, so busy I wasn’t quite comfortable to walk around and enjoy the cars. This year it must have been as busy, but it didn’t feel that way. The atmosphere, as always, was relaxed and people in general gave others the time to have a good look at cars or take photos. Perhaps it helped that we arrived earlier than last year. We were there just before it opened at 09:00. But then again, we had to – Dario Franchitti’s first signing session was at 09:55! This year there was quite a list of things that attracted me. 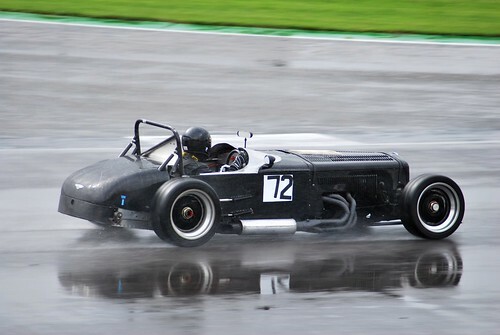 The fact they had all seven surviving Lotus 49s there (see photo above) was certainly a bonus. Now I’ve been to Classic Team Lotus’ home I am even more interested than I was before and this is a sight to behold. There was a reasonably large number of Aston Martins, always a good thing in my books, and looking out for the hordes of classic Minis (racing or otherwise) is good fun. Because I was so early I finally got a chance to get in a Ginetta. 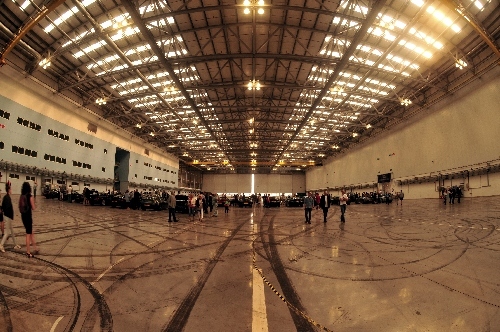 After the Caterham experience in 2014 the hall which also holds the karting track has been host to the Ginetta Experience. It’s basically the same as the Caterham experience – donuts! – but then in a Ginetta. And who doesn’t love Ginettas? I have a huge soft spot for these fearless cars with faces. I can now tell you they are as much fun to be driven around in as they are to watch while they’re racing. I guess it’s time I book myself a chance to drive one, right? This year I didn’t see the show at the Live Action Arena. We had booked it for very late in the afternoon, because we already knew there would be a chance we wouldn’t go to see it. But with paddock passes you can still see what’s happening backstage at the show. And as before a lot was on repeat. I don’t think it matters much, because there will always be people who visit for the first time. The racing series which are represented in the show seem like fun and who would want to deny them a chance at a bigger audience? I did spot an Aston Martin DB11, which was a bonus. I didn’t find the electric GT car, which I am curious about. Thankfully the Formula E car was easier to spot, as that was positined near the F1 grid. The car of choice was a Jaguar. And Jaguar is this year’s newcomer in the series. It was parked right behind James Hunt’s Hesketh, so the show’s combination of old and new was very evident. Coys had a lot of nice classics on display which were going under the hammer that weekend (as in: auctioned off, not destroyed). One of them caught me off guard. It looked like an Aston Martin Ulster, but turned out to be a gorgeous replica. Still an absolute joy to see! A large part of the show is filled with stands of companies specialising in stuff we petrolheads without a project car wouldn’t be interested in. If you’re such a petrolhead, like me, do look around. Some of these stands have amazing cars on display. You might be missing out if you don’t go and have a look. Overall this year was a better experience than last year, not only due to the less busy feeling, but also due to the diversity. For me personally there were many cars that have my attention and which became the reason for my visit. I spent five hours at Autosport International and can report I was a happy petrolhead when I left. 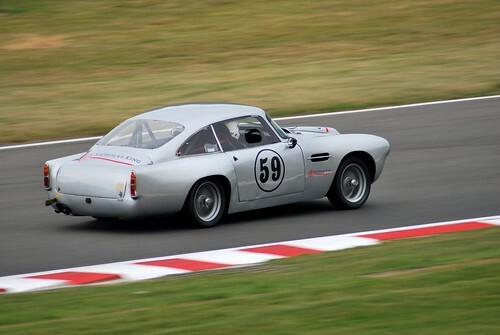 A few years ago, when I was still a member of AMOC (Aston Martin Owners Club), I was aware they organised races. Because I didn’t have a car, I never got to attend any of these race meetings. This year I’ve been to four of them. The last one of this year was at Silverstone and it was quite something. In 2016 Silverstone has been ‘behaving’. I’ve been several times and we’ve seen snow, rain, wind, sun (too much of it) and more rain. On 1 October it was predominantly rain. It made the racing all the more exciting to watch. I can only imagine what that must be like from a driver’s perspective when you’re trying to keep your classic race car on the track. Despite the weather the entire day was very enjoyable. 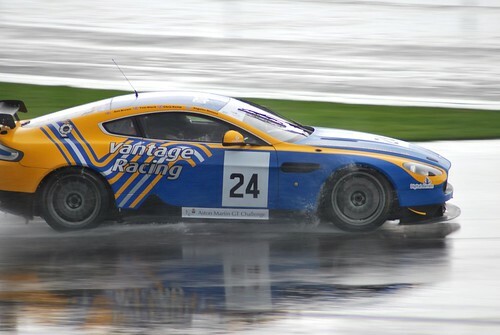 Tom Black’s Aston Martin GT4 during the Aston Martin GT Challenge. As was to be expected, it was not very busy. Only one grandstand was open (BRDC Grandstand) and it was not 100% filled. It is however a wonderful place to view a race from due to how much of the track you can see. Luffield corner is a spot where a lot happens normally anyway and this day was no exception. Several classics did drift off the track, but thankfully most managed to save the car before it went into the gravel and rejoin the race. Often this resulted in applause from the grandstand. The variety of cars on track is astounding. Of course there are Aston Martins, but this time there were a lot of MGs. The Intermarque Championship/GT Challenge saw the return of the Porsches and BMWs. The 50s Sports Cars race had several absolutely gorgeous Austins and Jaguars. For me the icing on the cake were the pre-war Astons: an Aston Martin Le Mans (1933), Aston Martin 15/98 2 seater (1937), Aston Martin New International (1932) and Aston Martin Ulster (1934). In that race there was one more pre-war car: a Bentley MK VI of 1948 which was unbelievably fast. The sound was a delight…I think I know where the current Bentley team gets their slogan (Bring The Thunder) from. The Bentley MK VI (1948) driven by Michael Haig took victory in t he Pre-War race. We’d seen this car in the paddock, but on track it is a magnificent beast. During the lunch break some of the AMOC members took their Aston Martins to the track for a parade. I was lucky enough to be able (and allowed!) to go to the pit wall and watch them go by (camera in hand, of course). Some of the boxes were open, so I wandered in here and there to snap a few photos of the cars. It was an amazing opportunity to see some of these classics up close. 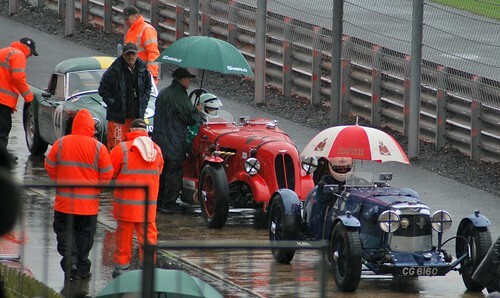 The participants in the MG Acers/pre-War race are waiting in the rain for their race to start. It was once again a fun filled day with beautiful cars and a very relaxed atmosphere. I have enjoyed the four race meetings I’ve been to so much I intend to go to as many as I can next year. So keep your eyes peeled for more beautiful Aston Martins of various ages in 2017. As before there were several other marques on track throughout the day, providing a wonderful diverse display of cars of various times. I can only assume there are more than just Astons on track because there are simply not enough of them to fill the entire programme (if anyone knows otherwise, please let me know). Any chance to race given to anyone I would consider a good thing. It might just introduce AMOC Racing to fans of other marques and non-Aston Martins to Aston Martin fans. After all, we share a passion for cars and racing. 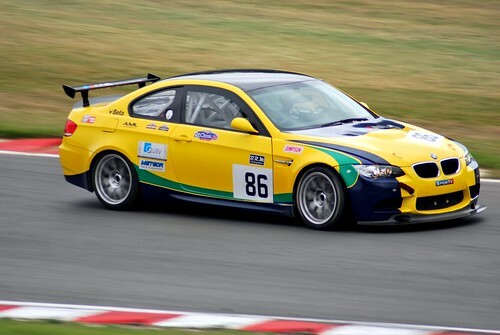 The BMW M3 GT4 of Jeremy Cooke and Mike Dowd during the Aston Martin GT Challenge. The weather couldn’t quite make its mind up (then sunny, then overcast, but thankfully always dry! ), but that didn’t deter the masses. Maybe it is because this is not the biggest of venues, but it felt a bit busy. Because I was there by invitation I saw a little bit less of the track action than normal. You know: places to go, people to see. What I did see was, once again, close and passionate racing. It is always great to see cars go nose to tail through the corners; or even side by side! When you hear the commentators calculate, lap by lap, how close cars are, you know a pit stop can and will make the difference between winning or coming in second. Edge of your seat stuff! 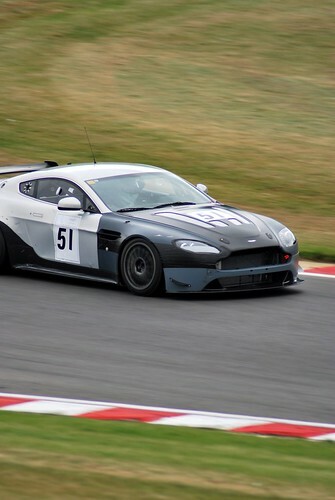 Robin Marriott’s Aston Martin GT4 (with tape and all!) during the Aston Martin GT Challenge. During lunch there was a track parade. That’s where my bonus comes in. I was a passenger in a beautiful dark green DB7. And it was awesome. It’s hard to describe what it feels like to be on the track in a gorgeous and luxurious car between a large number (an estimated 70) of cars of similar description. 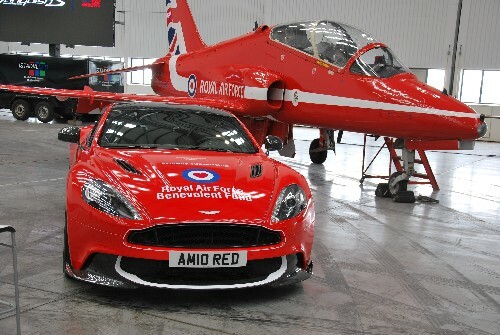 To see the stunning DB9, Vanquish S and DBS in front and know there are DB4s behind you, to name but a few. To hear the V8 nearby when everyone speeds down the pit straight. That feeling when the car accelerates and you get pushed in your seat and then the slight movement forward under braking, the car’s nose going down. And this isn’t racing, this is just a bit of fun. I guess a love for cars is required to understand the grin and goosebumps this causes. What more can I say? I’ve just spent a day among Aston Martin enthusiasts, some of whom race during a fun filled day. I think it’s safe to say, after spending three days with them, that AMOC Racing throw a good party. The next and last AMOC Racing meeting of 2016 will be on 1 October at Silverstone.